I recently applied for a few part-time jobs- partly to help sustain my income from baking, and partly out of curiosity and a desire to do something new. I've been working in kitchens for the last five years and though I really do love making sweet things most of the time, I was excited at the thought of expanding my knowledge and interests in other areas. The last time I had any sort of retail experience was over seven years ago, but I went out on a limb and applied anyway... I was confident that my enthusiasm for the stores and products would be enough get my foot in the door. And I was right! I heard back from almost everywhere I applied to, went to a bunch of interviews over the course of three weeks, and got a job offer last week! I was super excited when they called me in for an interview with the hiring manager, and slightly nervous too because it was a group interview and I wasn't sure what to expect. It was only two other girls and I and we took turns answering work and fashion related questions- it was actually pretty interesting to listen to the other girls' answers. A few days later I got called back in for a second interview, this time with the store manager. That interview was one on one and more personality based; perfect for me because I'm really good at talking about myself... and a few days after that, they called me to offer me the job! 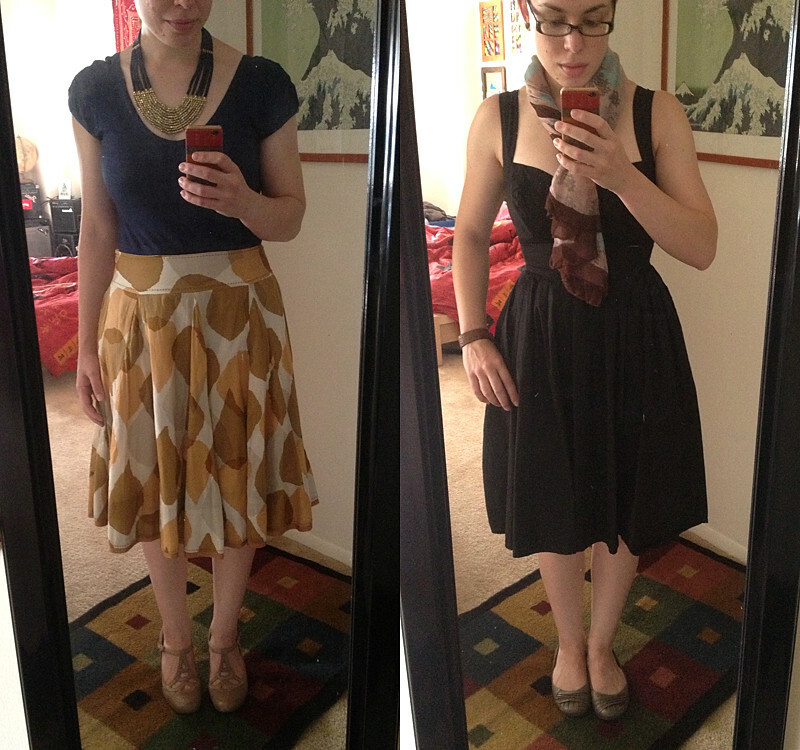 I tried to wear some Anthropologie-inspired pieces for both interviews. I've been really into skirts and dresses this summer and since Anthropologie has a very feminine vibe, I stuck with those. That was only my second time ever wearing that black dress and I can honestly say I don't know why I don't wear it more often... it's ridiculously comfortable and I feel so dang good in it! (P.S. It's the Fifties Sundress from eShakti, custom fit.) Needless to say, I'm really looking forward to being able to dress up for work for the first time in my life. After ten years of t-shirt & jeans gigs and chef coat & baggy pants gigs, wearing some pretty clothing and getting to accessorize sounds amazing. My first day of training was today; I'm so excited to work for such an awesome company!